Four boats with the wind. All of my boats are powered by Armstrong. For you boat neophytes; that is powered by strong arms and a 12 foot closet rod. You can purchase closet rods at your local lumber yard. The telescoping aluminum poles are expensive, don’t float and ice up faster than wooden poles. I don’t recommend them. There are several types of pole feet available. Cabalas’ has the duckfoot and the wooden foot (which is actually plastic now). I have friends that use only a pole with no end. Your selection will depend on the type of bottom where you will be poling. A hard bottom (flooded agricultural fields) where your pole won’t sink in the mud dictates a pole end which will get a bite such as the wooden foot or no end at all. A soft bottom (emergent marsh) needs an end which will keep your pole from sinking in the mud such as the duck foot. After you have selected your pole end and before you go to the marsh, throw your pole in the pond for a day. This will give the pole the ability to bend and maybe not break. If you are just learning how to pole, I suggest waiting for a warm day with little or no wind. I would also suggest that you practice poling before you go hunting. It will be a frustrating experience if you try to learn how to pole in the dark with a boat load of decoys, dog, gun, shells and lunch. 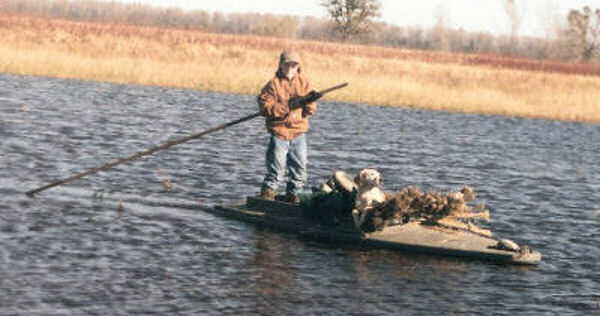 I teach kids about duck boats at youth waterfowl hunting clinics. The kids usually learn to pole faster than the adults. Most of the kids are poling a relatively straight line in about 20 minutes. At first, poling seems backwards. When you practice take a 5 gal. bucket, fill it with water and place it in the front of your boat to simulate a load (HINT: the boat steers better with a load). Will & Lilly on their own. Stand in the rear of the cockpit facing straight forward with feet a little wider than shoulder width apart. Imagine a point on the bottom of the marsh 2 or 3 feet behind your pole side shoulder. Place the pole foot there and push. As you glide through the water leave your pole in the water to act as a rudder. Pretty soon you will figure out that if you rudder your pole foot to the right, the nose of your boat will also go right. The next step after you place your pole on the bottom is to hand over hand until you run out of pole. This will give you some momentum. Be sure and leave the pole in the water to act as a rudder. Now practice, practice. As you might guess there are numerous opportunities to get wet. I have several hints which might keep you from taking a dip. Occasionally your pole will stick in the mud as you are poling. This may sound obvious, but when your pole sticks, let go of it or it will pull you out of the boat. I sometimes will hook my toes under the edge of the cockpit to give myself additional leverage against going backwards out of the boat. If you do happen to fall out of the boat you are automatically a member of the DUNKIN CLUB. There are a couple levels of membership. Regular membership requires at least two feet getting wet. 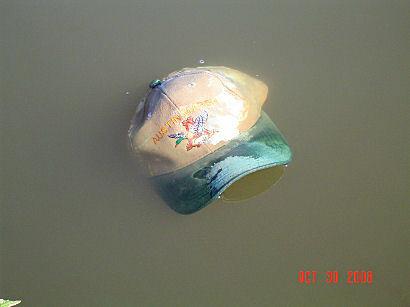 The "hat floater" is self-explanatory.